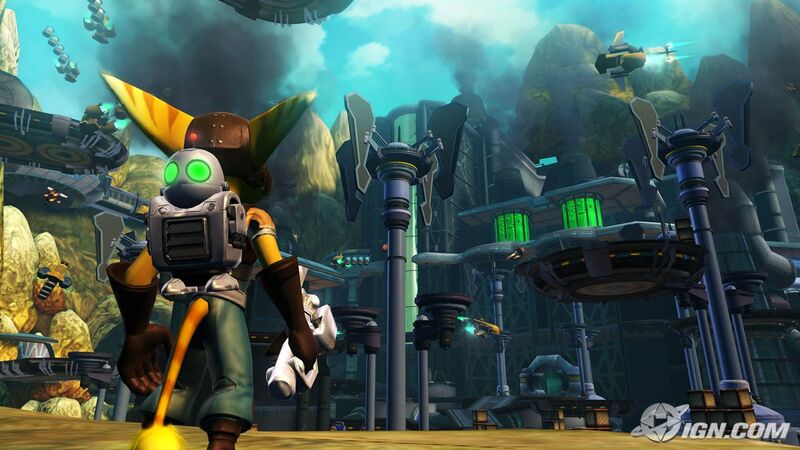 The Ratchet & Clank Future story opens with the shocking discovery that a villain from Ratchet's distant past has tracked him down and wants him dead. This revelation brings up many questions as to Ratchet's origins and launches Ratchet and Clank into a mysterious adventure where they begin to learn about his past, the villain's current evil plans, and a glimpse of the future. The story takes place after the past R&C games. Captain Qwark will also be featuring in this game, working undercover to give Ratchet and Clank clues that help guide them on their journey. wait till you see the groovitron bomb.talk about creativity. Groovitron, a disco ball-like grenade that makes enemies dance to the tune of Staying Alive by the Bee Gees. PS Ignorance is bliss. Why do you think i never searched for this game. 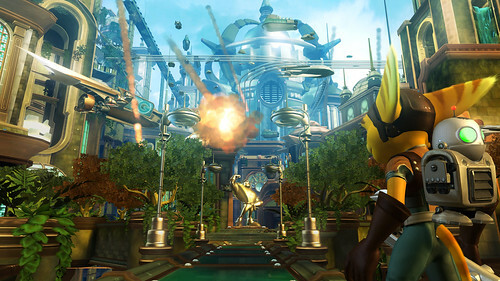 A few weeks ago, I blogged about the Resistance global server/map pack release date, along with a promise of a sneak peek at Ratchet & Clank Future: Tools of Destruction. Since then, an interview with RCF creative director Brian Allgier has surfaced here, teasing some details (such as enemies with evil fish steering a robotic body), and if you listen to the Insomniac Games Full Moon Show, they were promising a screen shot of said sneak peek - this screen shot I share with you now, check it out. There will also be penguins, courtesy of the Transmorpher. The Transmorpher is one of our new devices (along with the Grooveitron and several others that we haven’t announced yet) that will turn most enemies into penguins. Because, really, they are all the rage these days, and we didn’t want to be left out of the penguin craze; sheep are too last gen for us. The Groovitron creates an auditory stimulus that temporarily mesmerizes your opponent. Milestone has finally decided to wake up R&C. They are selling the original Ratchet & Clank for 999 INR. And IGN says If games were movies, this is what every trailer should look like.